Facebook's new settings let users view and download their data by category. Facebook on Tuesday debuted changes it is making to privacy controls as European data protection rules go into effect next month. With the changes, Facebook users will have more options to view and download data stored on Facebook, as well as an easy way to tell Facebook not to use third-party data as part of its ad targeting. The bottom line: While Facebook is offering the same tools to users globally, they will show up first in Europe this week, arriving for other users "in the coming weeks and months." In the past, users could download all their information as one big file. 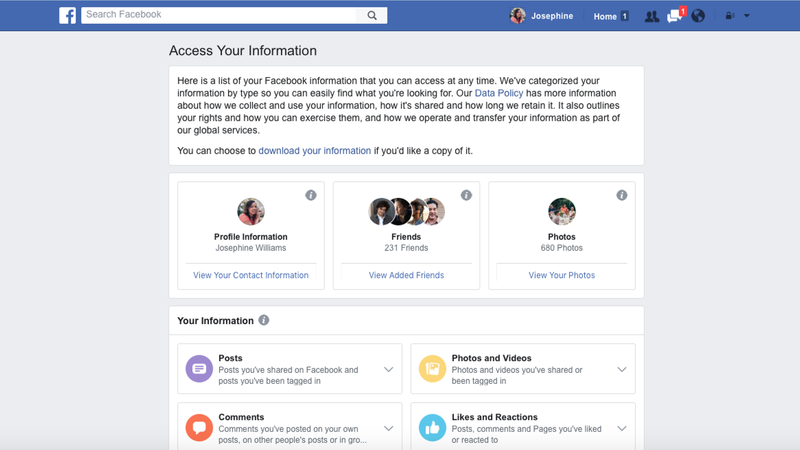 With the new changes, consumers can view personal data by category — posts, comments, messages, photos, and so on — and choose which type of information they wish to download. Users in Europe will for the first time be able to turn on face recognition, if they want. Customers will also get to choose whether to Facebook can use data acquired from others as part of their ad targeting. Facebook will remind people if they have made a political or religious affiliation as part of their profile and offer them the option to delete that information, considered more sensitive under the new privacy laws. There's still no option to opt out of ad targeting entirely, but a separate ad preferences option lets people remove specific interests for which they don't want to be targeted. But, but but: In many cases, Facebook is offering more information to users before they agree to the new privacy settings. However, it is still easier to opt in than to opt out. Users can say "yes" by clicking "accept and continue" on the first screen — but if they want to say "no," they have to click through to at least one more "manage my settings" page.